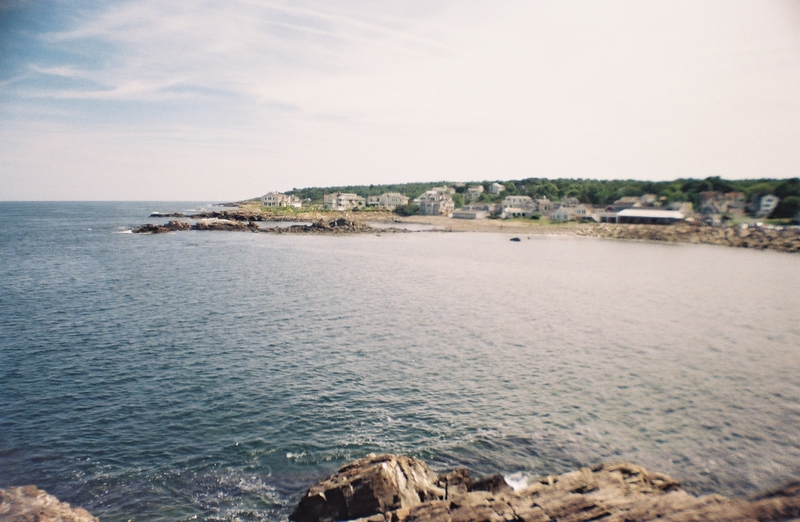 New England doesn’t get enough credit as a utopian summer seaside destination. 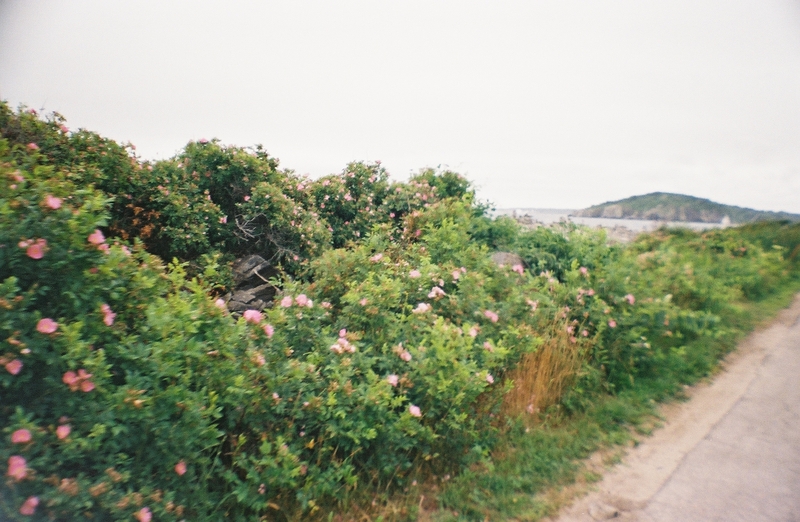 With lush gardens and sprawling beaches, the scenes are nothing short of idyllic. 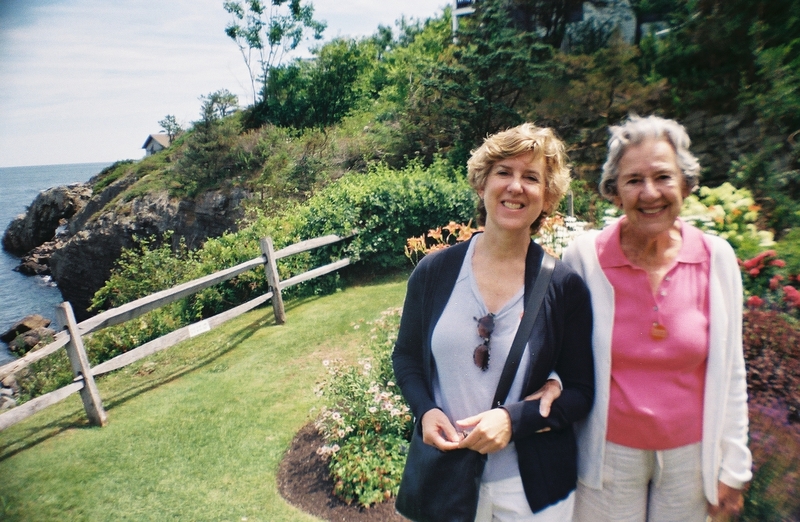 I got the chance to visit Ogunquit, where artist, Henry Strater, (BFFs with Ernest Hemingway and F. Scott Fitzgerald) constructed an art museum dedicated to sharing his passion with the world! 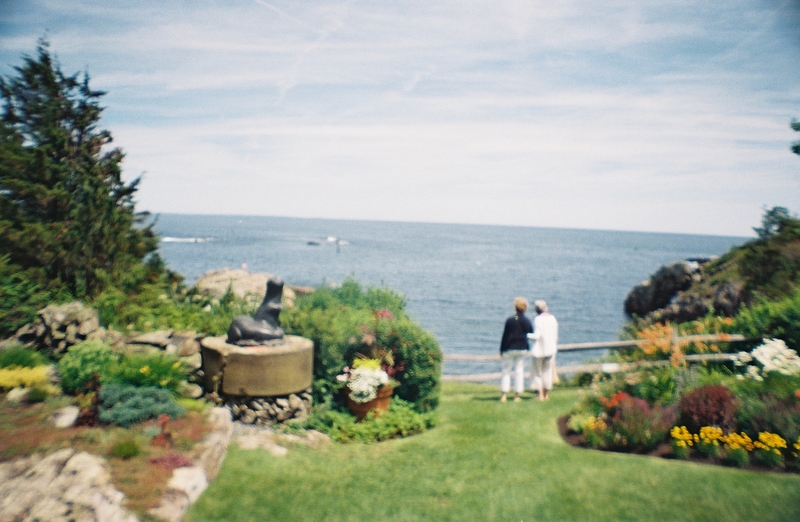 The Ogunquit Museum of American Art is a hidden treasure nestled along the shoreline by Perkins Cove, a scenic and historic viewpoint, where one could easily spend hours on any of the benches situated within the vibrant gardens and look out at the water; we were blown away. 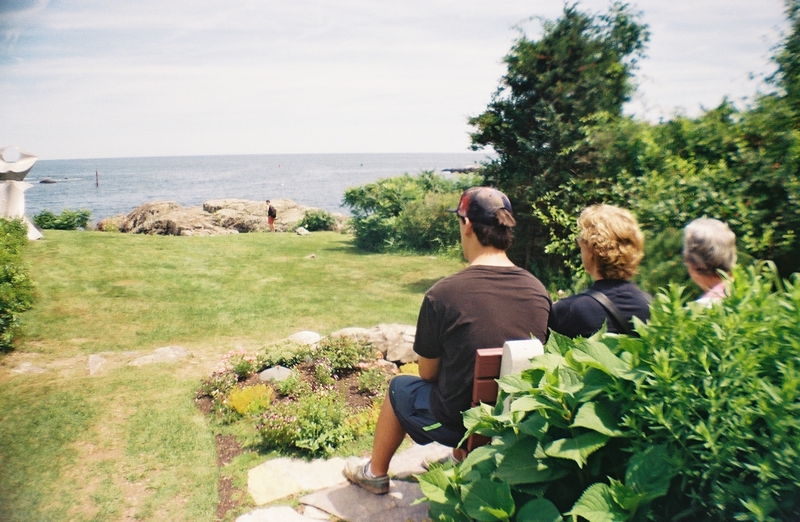 Our next stop, The Marginal Way, got some serious hype from Ogunquit.org, which (eloquently) claimed it to be “a paved footpath atop the cliffs, meandering through bayberry and bittersweet bushes, gnarled shrubs of fragrant sea roses, shaded alcoves, and expansive views of the Atlantic with all its varying moods. There is no better place to unwind and be overwhelmed by the immensity and vastness of nature, then come away feeling humbled and contented yet remarkably uplifted and refreshed.” I’m not one to argue; this hilariously poetic description does hold true. 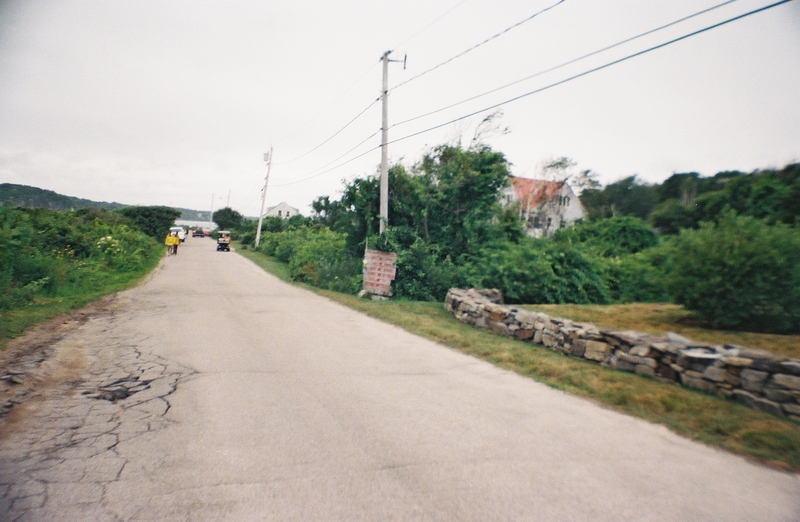 Perhaps justified by the landscape in the photo above, the Marginal Way was a vastly crowded tourist attraction. While the view is awe-inspiring, you will most certainly find yourself caught up in throngs of families visiting for summer vacation. Be mindful of screaming children. 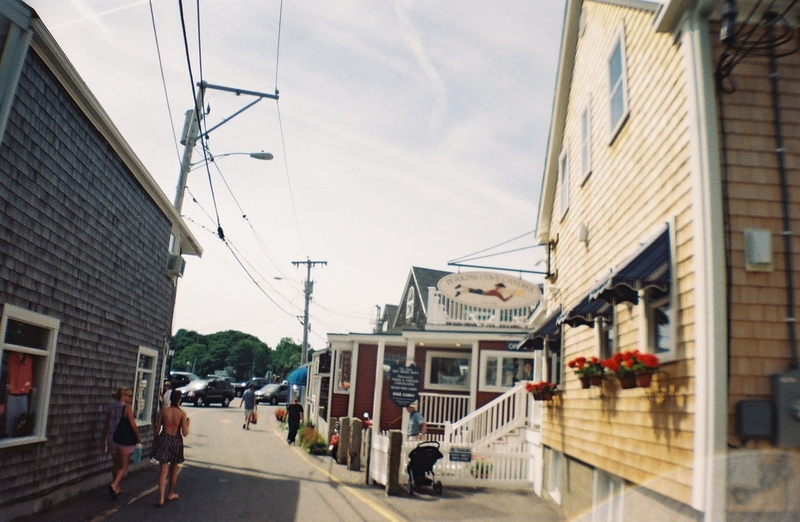 Also follow them into Perkins Cove Candies for some penuche fudge; you won’t regret it. If you’re in the area, check out the restaurant, Grace, a space converted from a church to an elegant dining area. Though it felt sacrilege to have a bar in an (ex) place of worship, it’s certainly a unique arrangement. The food was experimental, but the view of the stained glass windows was magnificent. 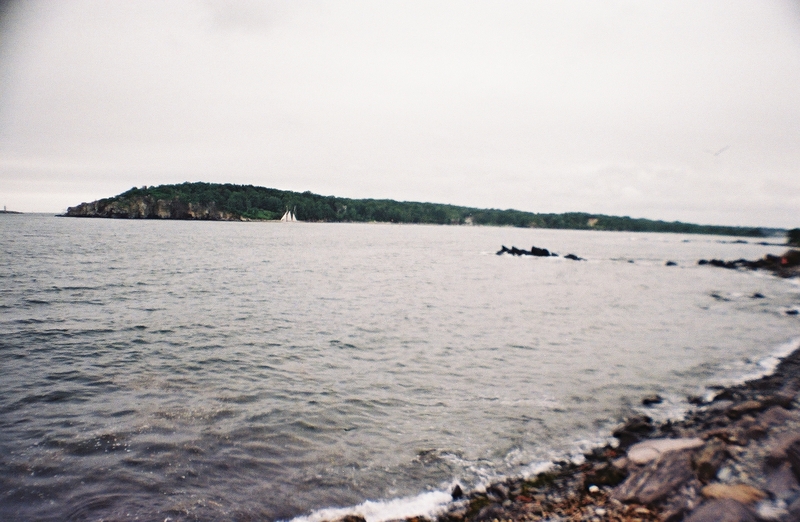 A popular destination near Portland is Peaks Island, accessible by ferry (a boat ride? Cool!). While the weather was foggy, we were nevertheless enthralled with the view. 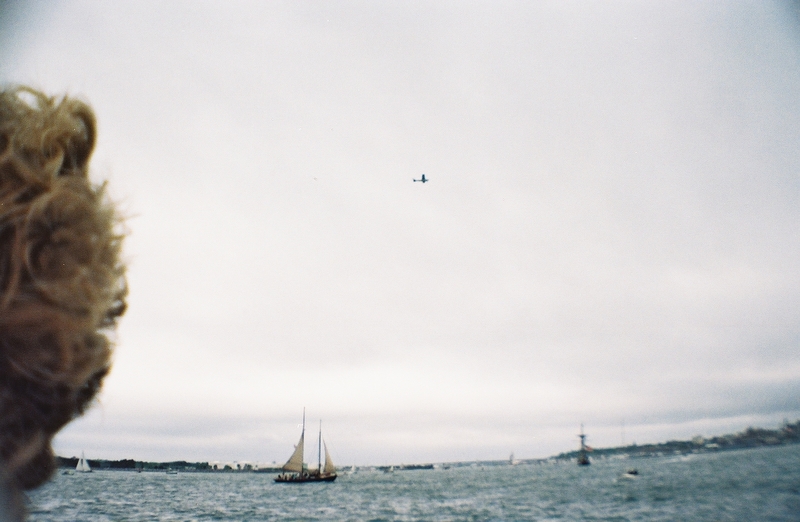 Even through the fog we were able to get a glimpse of the passing ships and a great view of the islands in Casco Bay. 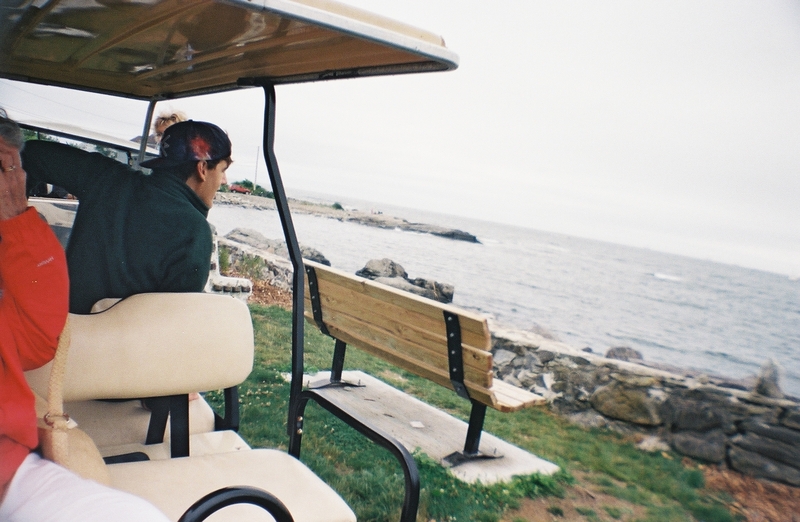 Once we arrived on Peaks Island, we explored the area around the harbor, only to find a golf cart rental stand–how could we pass up this exciting opportunity? 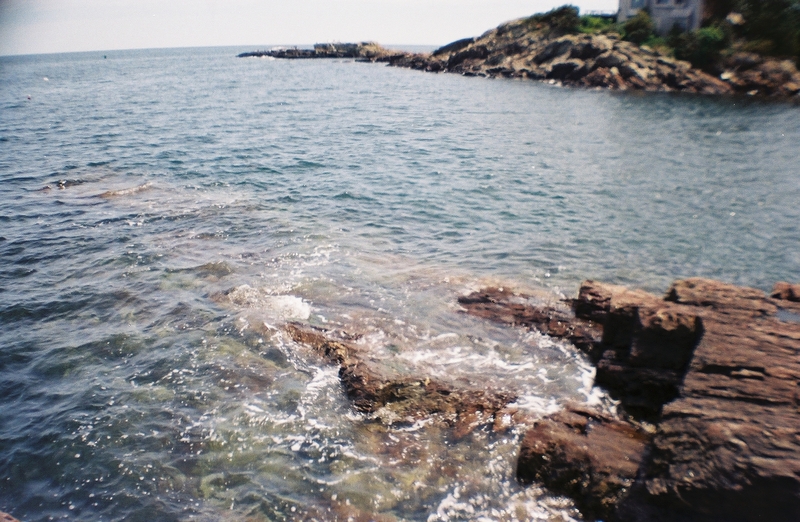 Luckily, we had a pizza delivery boy in our midst, who effortlessly handled the golf cart, and with minimal shrieking on behalf of our grandmother, we were able to enjoy the coastline view from Peaks Island, a well-kept-secret from the likes of tourists on the Marginal Way; we almost had the path to ourselves. 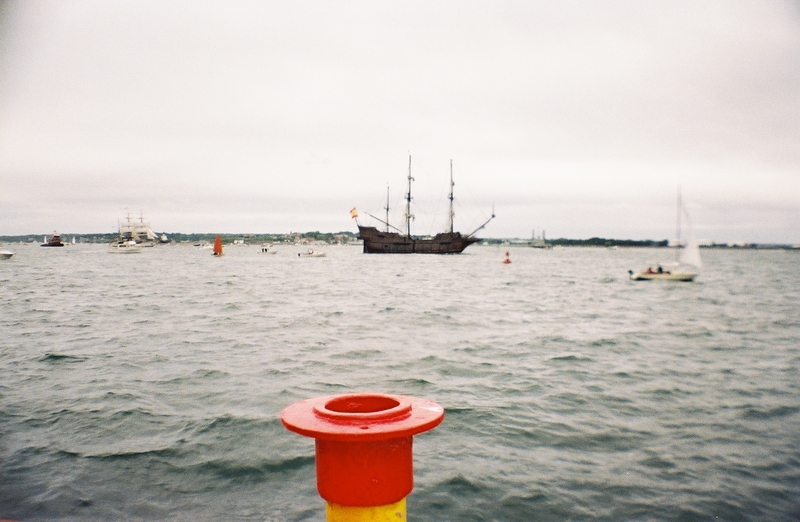 As the Tall Ships were beginning to arrive in the port, we caught a glimpse of the Spanish Flag, and what Dan informed us was the marking of a coast guard: a large red stripe across the bow. 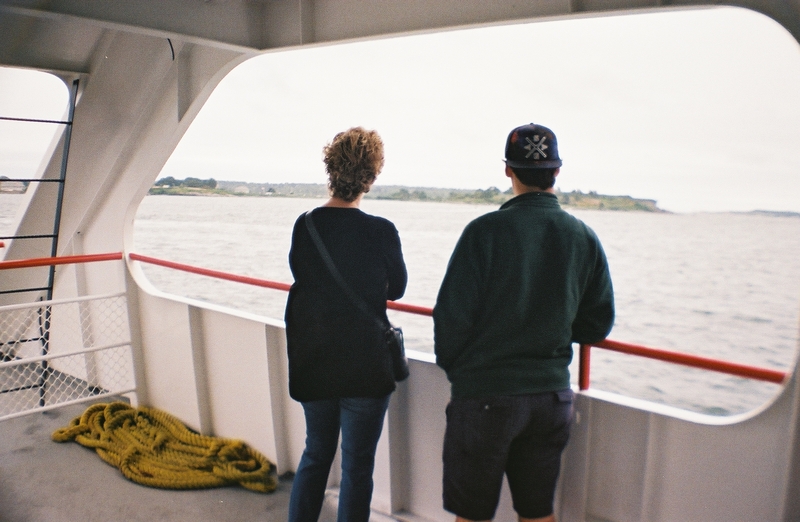 We boarded back onto the ferry, where, from the water, we really could see the ships! 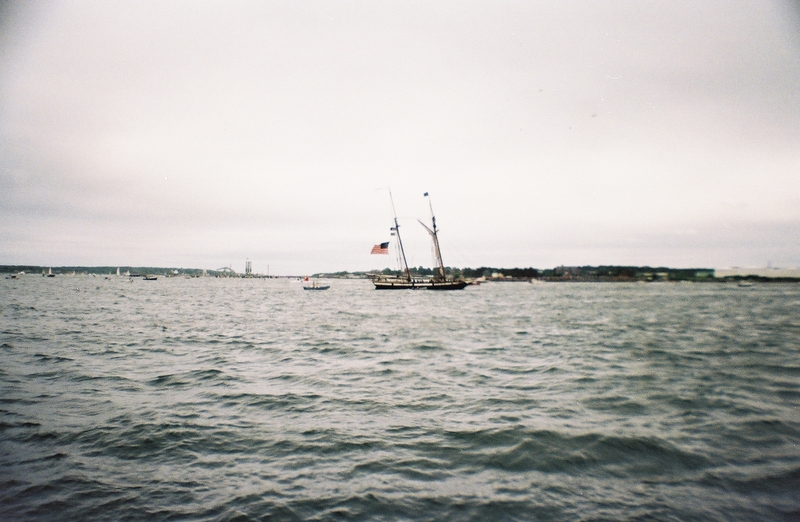 On the shore of Portland, crowds had collected to welcome the sailors from their journey overseas. It was a perfect note on which to end our vacation.